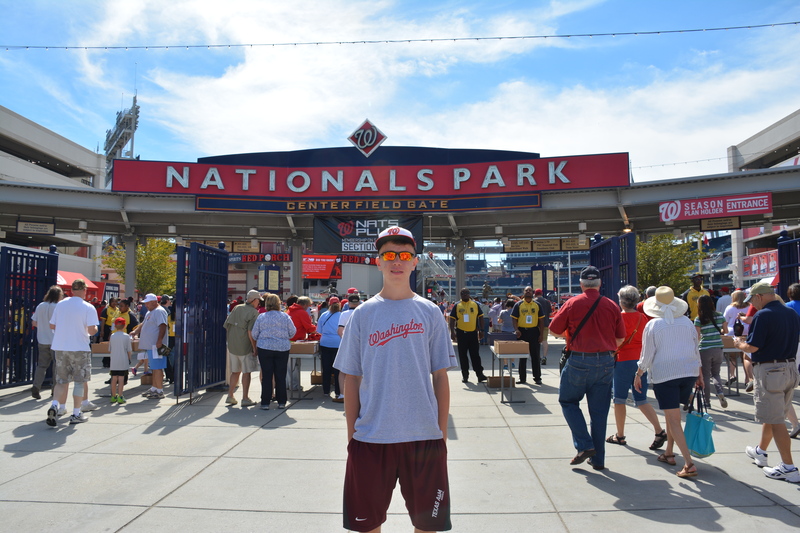 Just about a year and a half ago, instead of going to the second-to-last game of the season, my family decided we wanted to see Jordan Zimmermann wrap up the 2014 regular season at Nationals Park. What a decision that turned out to be, as he ended up throwing the first no-hitter in Nationals history. I attend Xavier University in Cincinnati, Ohio, otherwise known as Reds country. I hadn’t yet been to a game this season, and some of the guys on my hall who are avid Cubs fans wanted to get down to Great American to inevitably watch the Cubbies dismantle the over-matched Cincinnati Reds. With a paper due the next day and a horrible cold resting in my respiratory system, I strongly considered not going to the game. However, I finished the paper before the game and took up the offer on the tickets. Turns out, it would end up being an above-average decision. Disclaimer: I grew up a Reds fan before the Nats made the great exodus from Montreal. One thing was for sure, there was not a chance I wanted them to break up this no-hitter. We sat in left field by the foul pole, and Jake Arrieta toed the rubber for Chicago. No sooner were we settled in our seats than Kris Bryant launched a home run into the second deck above us. That was far from the last of the offensive production from Chicago, who would go on to score 16 runs. As the game got into the fourth inning, I began noticing with increased awareness the big fat goose-egg in the hit column for Cincinnati. Along about the sixth inning, Nick and Danny went to sit on the first base side with a couple friends from Xavier. Me being as superstitious as I am, I was supremely hesitant to change seats in the middle of a no-hitter. Who does that?! I gave up the fight, and Spike and I joined the group along the first base line. I was certain Arrieta would promptly surrender a hit, but that was not to be. Red after Red retreated to the dugout. One observation I made as the buzz in the stadium started to swirl: this was not by any means one of his best starts. No-hitters aren’t all that much of a rarity, far from that of a perfect game, and it’s often a bad team that just can’t hit a gap. I saw Arrieta’s pitch count rising quickly, and began to worry if he would even finish the game as he walked his third batter. Statistically, this wasn’t even Arrieta’s best-pitched game since last August. Ninth inning now. There is almost a tangible anxiousness sweeping across GABP. The crowd, the vast majority of which is donning blue, gradually gets their phones out to start recording. Two outs. Jake Arrieta is one out away from his second career no-hitter, and his second in his last 16 starts. Eugenio Suarez strode to the plate as the last hope for the Reds to avoid what seemed to be the inevitable. With two strikes, home plate umpire Dana DeMuth called a ball on what appeared to be a strike, and what would have been long debated had Suarez not flied out to Jason Heyward. Arrieta is now 15-0 with a 0.54 ERA in his last 16 starts (ESPN). He has allowed seven earned runs since the beginning of last August, and during that time eight pitchers have allowed at least that many in one innings. Also, the Cubs has won his last 17 starts (ESPN Stats and Info). Needless to say, he’s a major reason why the Cubs are one of the favorites to win the World Series. Oh yeah, I would be remiss without mentioning that some dude thought it was a brilliant idea to run on the field and celebrate with Arrieta after the final out. Although, if you’re gonna storm the field, get fined, and go to jail, that’s probably as good a time as ever. Tonight, Arrieta looks to match Johnny Vander Meer as the only pitchers to throw back-to-back no-hitters. His matchup is the Milwaukee Brewers. So, to recap, the first game I attended of the 2016 season was the second no-hitter I’ve seen live. Here is to what lies ahead the rest of this season. 2014 was a year which fell short of expectations for the Nationals. We made the playoffs, but once again could not make it out of the first round. As we ring in 2015, for my first post of the year I decided to rank all 30 teams of Major League Baseball by how much I like them. Steve just did this yesterday, and he was saying he’d like to see what I thought. I’m excited to see what this year brings! Feel free to comment on your preferences or if you feel, in your opinion, I got something wrong. 1) Washington Nationals – Does this really need explanation? 2) Cincinnati Reds – Without a DC team, I loved the Reds with so much of my family from Cincinnati. I still love the Reds, but only when they don’t play the Nats. If anyone has tickets to the All-Star Game this year, let me know. 3) Chicago Cubs – It’s been a lot of years since they’ve won the World Series. If the Nats aren’t in it, I would guess a lot of baseball fans would like to see them take one. 4) Chicago White Sox – First Adam Dunn and now the beloved Adam LaRoche. They also signed David Ross, the veteran catcher, who I met a long time ago when he was a member of the Reds. I wouldn’t mind seeing them win. 5) Kansas City Royals – Captured America this year during their magical postseason run. Sadly, they ran into a certain roadblock by the name of Bumgarner. 6) Cleveland Indians – Poor Cleveland. It seems like they have pieces to do well, it just needs to come together. 7) Seattle Mariners – I’ve been to Safeco, and the Nats have good memories from this year of their visit to Seattle. 8) San Diego Padres – All of a sudden the Padres mean business. They got Derek Norris, who I’ve watched progress since his days with Potomac, and a bunch of other big name players recently in free agency. I wouldn’t mind seeing them do well. 9) Houston Astros – Their mascot, Orbit, is about the only reason they’re this high on the list. He’s probably the best mascot in all of MLB. Click here, here, here, here, here, here, and here to see why. 10) Miami Marlins – Stanton drops bombs. I’m still trying to catch one of his BP homers when the Marlins come to Nationals Park. 11) Colorado Rockies – Coors Field is so nice, I’ve seen a game there, and my dad lived in Colorado for a while. They also participated in a stand-off with the Nats this season, which I loved. 12) Tampa Bay Rays – One of my favorite movies ever is The Rookie, and Jim Morris was on the Rays. 13) Oakland Athletics – Moneyball showed such an interesting view of baseball, and poor Oakland never seems to succeed anymore. Before the Royals grabbed my attention, I was hoping the A’s would find themselves in the World Series. 14) Detroit Tigers – I played on the Tigers and it gave me some of my best youth baseball memories. 15) St. Louis Cardinals – They win a lot. A lot of people really don’t like them. I, however, are one of few neutral fans who don’t mind them. I love watching the battery of Wainwright and Molina. There’s a reason they’re not higher up on this list, but those are the reasons they aren’t lower either. 16) Texas Rangers –Jim Morris made his debut for the Rays on the road at the Ranger’s stadium. I’ve also seen their stadium from driving around it, and it was a sight to see. 17) Minnesota Twins – Anymore, the Twins are sorta just, there. Not great, not awful, just there. 18) Toronto Blue Jays – You don’t hear a ton about the Blue Jays but watch out this year, they could make a run for the AL East. 19) Los Angeles Angels – Mike Trout is a stud. Also, I rooted for Anaheim when they were in the World Series a lot of years ago. 20) Los Angeles Dodgers – I don’t particularly dislike the Dodgers, but I don’t really like them either; I’m indifferent. 21) Arizona Diamondbacks – Whenever I went to Reds games when I was younger, it seemed like I always saw the Diamondbacks play. There was only so much of Craig Counsell’s swing I could take. 22) New York Mets – I also played on the Mets in Little League, but being in the NL East, I don’t like them as much. 23) New York Yankees – Along with the Cardinals, I don’t hate the Yankees. But Derek Jeter was one of the major reasons I tolerated them, and now that he’s gone, they’ve fallen lower on this list. 24) Milwaukee Brewers – I still remember sitting in the hotel room in Virginia Beach and watching Josh Willingham hit his second grand slam of the game for the Nats in Milwaukee. 25) Baltimore Orioles – Peter Angelos, why do you make things so difficult? They also ruin the National Anthem. 26) Philadelphia Phillies – Lingering dislike from when the Phillies fans would pack Nats Park. 27) San Francisco Giants – I’m just not a huge Giants fan. Used to love them with Barry Bonds, but then he used steroids. 28) Pittsburgh Pirates – I don’t have a ton against the Pirates, except that they play in Pittsburgh. And that right there is the major problem. 29) Boston Red Sox – Boston and Pittsburgh, my two least favorite sports cities in America. I’ve visited Boston (not Fenway), and the city itself has so much history. But we’re talking sports and baseball here, and man do I not like those two cities’ teams. 30) Atlanta Braves – If you thought anyone else would be last, then you obviously don’t know me very well. First and foremost is the most exciting news. My dad received two tickets to Opening Day at Nationals Park for his birthday, which means he and I will be taking in all of the April 4th festivities! I will be sure to take lots of pictures and report back on all the happenings. Sadly, it’s against the Barves (yes, that was on purpose), but Opening Day is Opening Day and I can’t wait to be apart of it. Once again this year, Sports Illustrated has chosen the Washington Nationals as their pick to win the World Series. As many of you may remember, they also chose us last year and some blamed the disappointing season on this “curse.” We will see how the year plays out and if, hopefully, they will be correct. From a roster standpoint, the most notable move of the month was new manager Matt Williams’ decision to send Ross Detwiler to the bullpen to begin the season. Many presumed he would take over the role of 5th starter behind Strasburg, Gonzalez, Zimmermann, and Fister, but that was not to be. Rather, it is still a competition between last season’s two star rookies, Taylor Jordan and Tanner Roark (pronounced Row-ark). Doug Fister will likely start the season on the disabled list after suffering a strained lat as Spring Training came to a close. Hopefully he recovers quickly and can get back as soon as possible. On a positive note, barring anything drastic happening in their exhibition game against the Tigers this Saturday, this will be the most serious injury coming out of Spring Training. Needless to say, the Nationals were pretty lucky in not suffering any major/serious injuries. On a personal note, the high school baseball season is already underway. It feels good to once again be playing baseball myself. I’ll keep you all updated on how we do as the season progresses. Only four (4!!!!) more days until the Nats open their season away against the Mets on Monday. We’ve been waiting long enough, let’s get started.